Heat olive oil in a Dutch oven or stock pot over medium-high heat. Once hot, add the diced onions, carrots, and celery; cook 5 minutes or until softened. Add the diced zucchini and cook an additional 4 minutes. Add the garlic, red pepper flakes, thyme, and rosemary; cook for 30-60 seconds or until fragrant. Stir in the broth, beans, and tomatoes and bring to a boil. 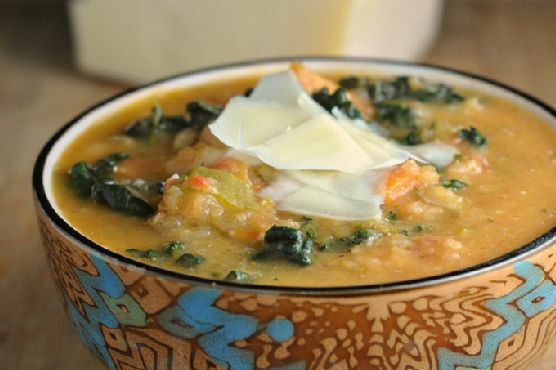 Reduce heat to low, stir in the kale, cover and allow to simmer for 15 minutes.Using an immersion blender (or standard blender blending just a portion of the soup), partially puree the soup to create a thick, creamy texture or to desired consistency.Stir in the salt, pepper, sugar, and vinegar. Cook an additional 2-3 minutes and serve hot.